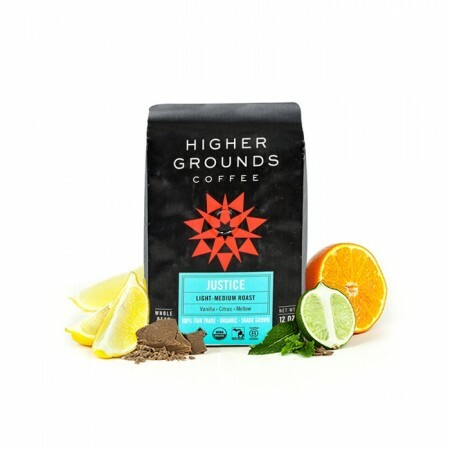 This is the Justice brought to you by Higher Grounds Coffee. Fair Trade and Organic certified coffees from Ethiopia and Guatemala were carefully chosen to create this unique blend. Their version of a breakfast blend, this medium light roasted blend balances a lively citrus acidity with a smooth note of vanilla in the finish. Coffee flavor was great when I could pick it up, but not as full-bodied as I prefer. Drinking it reminded me of drinking tea. The coffee smelled fine, but nothing spectacular. Might be one of the best blends I've had in months. The notes of Citrus and carmel dance SO well with the natural notes from the beans. Get this whole bean, you'll be happy that you did. Also, I should mention that I prefer dark roast....yeah, not anymore. Very good. I found it very finicky and that it could end up a little bitter if not brewed perfectly. I have a Moccamaster coffee maker and still had inconsistent results. Overall I did like it though and would order it again. Couldn't pick up the citrus, but got the caramel notes. Brewed pour over with the chemex and it came out very smooth, which we liked. Not sure I would go much lighter than this. We loved this one and consumed it quickly. I can’t remrmber the taste profile unfortunately.